Our very own Harriet Randvansky received the Excellence in Enduring Service Award at the ISA Honors and Awards Event on September 24th in Orlando, FL. Bill Stange of the Dayton Section got the Division Leader of the Year Award. Gerald E. Gilman, P.E. of the Cincinnati Section was made an ISA Fellow. See the pictures here. In addition, the August Golf Outing and the October Cedar Point pictures are now posted. Our tour starts in the chemistry lab. As the furnace is melting a “heat”, a sample is taken and sent via pneumatic tube to the lab. The sample is analyzed and sent back to the furnace system which uses the analysis to determine the alloy materials to bring the product to the required chemistry as specified by the customer. The next stop is viewing the “melt floor”, where we will watch a bucket of scrap metal being charged into their electric arc furnace. The roof is swung away from the top of the furnace, a crane moves the bucket of scrap over the furnace, opens the clamshells on the bottom of the bucket allowing the load to fall. The tour then moves on to the soaking pits and the rolling mill areas. In the meantime, the “heat” (batch) at the furnace is tapped into a ladle (this happens 16 to 20 times per day). Each ladle hold about 165 tons of molten steel per dump. A crane moves the ladle to the refiner position where alloy additions are finalized and dissolved gases are removed from the steel; then moved again to the bottom pouring area which is teeming with ingots. After the steel solidifies in the molds, the batch is moved to the rolling mill and placed into soaking pits. In the rolling area we will watch an ingot’s contents being removed from a soaking pit and the hot metal deposited into the cradle ahead of the blooming mill using a high reversing process to progressively roll the metal into a smaller and smaller cross sections. Then we view the “bloom” being scarfed to remove surface defects before proceeding to the shear where the top and bottom of the “bloom” are cut away. At this point the piece may exit to be rolled to its final size at another plant or continue on to the billet mill. Their billet mill rolls the metal to the customer’s size and shape specifications, usually round or square bars from 6 to 16 inches in length. These pieces are then sawed into shorter lengths for shipment. After the tour there will be a presentation of the automation and controls systems used to monitor, control and collect data about the product and the processes used. 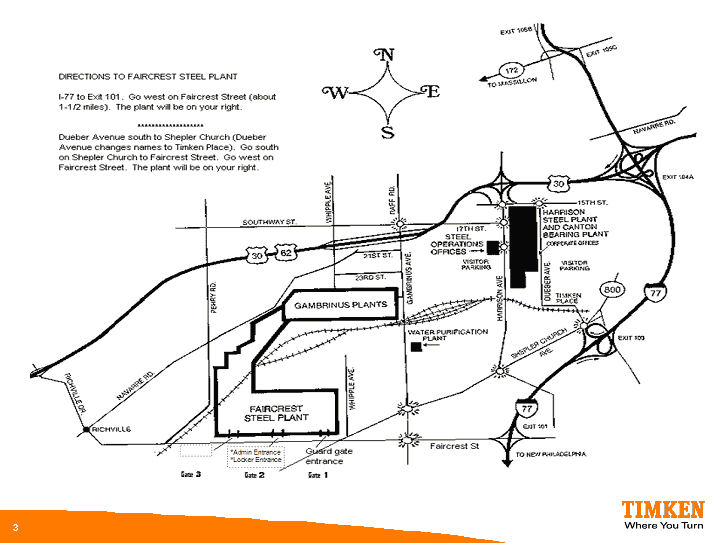 I-77 to Exit 101 Go west on Faircrest Street (about 1 1/2 miles) The plant will be on the right Enter the plant through Gate 2. Park anywhere in the lot. Proceed to the brick entrance on the left side (next to flagpole). Open the door and proceed into the Administration Bldg. PPE (personal protective equipment) will be distributed at the Administration Bldg. If you have any questions or concerns, please contact: Jenni Gay at (330) 471-7815 or Jennifer Simmons-Choate at (330) 471-7513. Reservations Required by Nov 9th.